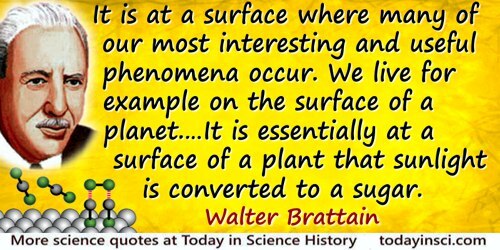 ... there is an external world which can in principle be exhaustively described in scientific language. The scientist, as both observer and language-user, can capture the external facts of the world in prepositions that are true if they correspond to the facts and false if they do not. Science is ideally a linguistic system in which true propositions are in one-to-one relation to facts, including facts that are not directly observed because they involve hidden entities or properties, or past events or far distant events. 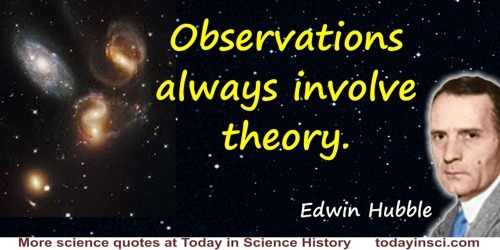 These hidden events are described in theories, and theories can be inferred from observation, that is the hidden explanatory mechnism of the world can be discovered from what is open to observation. Man as scientist is regarded as standing apart from the world and able to experiment and theorize about it objectively and dispassionately. 'Introduction', Revolutions and Reconstructions in the Philosophy of Science (1981), xii. In John Templeton and Robert L. Herrmann, Is God the Only Reality (1994), 11-12. Every definition implies an axiom, since it asserts the existence of the object defined. The definition then will not be justified, from the purely logical point of view, until we have ‘proved’ that it involves no contradiction either in its terms or with the truths previously admitted. 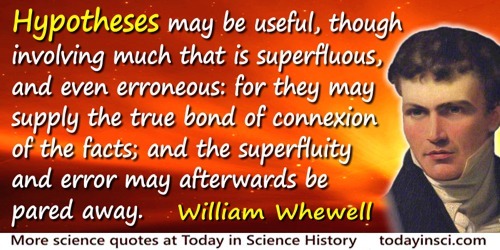 However closely we may associate thought with the physical machinery of the brain, the connection is dropped as irrelevant as soon as we consider the fundamental property of thought—that it may be correct or incorrect. …that involves recognising a domain of the other type of law—laws which ought to be kept, but may be broken. Swarthmore Lecture (1929) at Friends’ House, London, printed in Science and the Unseen World (1929), 57-58. I uphold my own rights, and therefore I also recognize the rights of others. This is the principle I act upon in life, in politics and in science. We owe it to ourselves to defend our rights, for it is the only guarantee for our individual development, and for our influence upon the community at large. Such a defence is no act of vain ambition, and it involves no renunciation of purely scientific aims. For, if we would serve science, we must extend her limits, not only as far as our own knowledge is concerned, but in the estimation of others. Cellular Pathology, translated by Frank Chance (1860), x. Medicine would be the ideal profession if it did not involve giving pain. The Health Master (1913), 61. In The Realm of the Nebulae (1936), 35. Our reasonings are grounded upon two great principles, that of contradiction, in virtue of which we judge false that which involves a contradiction, and true that which is opposed or contradictory to the false. The Monadology and Other Philosophical Writings (1714), trans. Robert Latta (1898) 235. The examining physician often hesitates to make the necessary examination because it involves soiling the finger. The first step in finding the solution to a problem often involves discovering a problem with the existing solution. The longer I practise medicine, the more convinced I am there are only two types of cases: those that involve taking the trousers off and those that don't. Spoken by character Dr. Wicksteed in play Habeas Corpus (1973). Mysticism and Logic: And Other Essays (1919), 44. 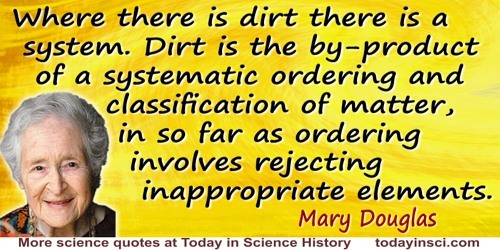 The very foundation of our science is only an inference; far the whole of it rests an the unprovable assumption that, all through the inferred lapse of time which the inferred performance of inferred geological processes involves, they have been going on in a manner consistent with the laws of nature as we know them now. 'The Value of Outrageous Geological Hypotheses', Science, 1926, 63, 465-466. This is what writers mean when they say that the notion of cause involves the idea of necessity. If there be any meaning which confessedly belongs to the term necessity, it is unconditionalness. That which is necessary, that which must be, means that which will be, whatever supposition we may make in regard to all other things. A System of Logic, Ratiocinative and Inductive (1858), 203. We all have a tendency to think that the world must conform to our prejudices. The opposite view involves some effort of thought, and most people would die sooner than think–in fact they do so.